Dome Cover with 2 End Cuts - Cal-Mil Plastic Products Inc. This pastry display or chafer cover is a perfect addition to any bakery, cafe, or food service area. It features a dome cover with openings on both ends for both the customer and the attendant convenience making it simple to refill and serve. It will showcase your pastries, bagels, and warm baked goods while keeping them fresh and protected! 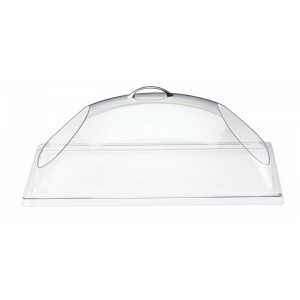 Polycarbonate dome cover with openings on both ends.